I recently stumbled on a community site called Superuse which catalogs and promotes the idea of transforming waste into something useful or beautiful. Not all of the ideas on this site are fine art, but they're certainly all great ideas for reusing materials to reduce waste. 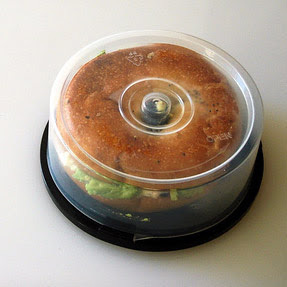 I haven't even begun to have the time to look at all these clever innovations, but I love this idea above...a CD spindle does make the perfect instant lunchbox for a bagel sandwich! Brilliant. You can see more clever ideas for reuse here, or jump to the section of art made from recycled materials here. 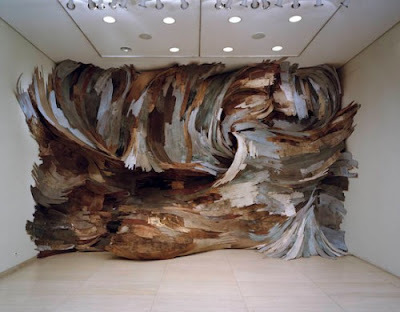 Brazilian artist Henrique Oliveira uses wood collected from the streets of São Paulo to create huge installations that he calls "tridimensionals". The thin sections of wood, obtained from old fencing and boarding known as "tapumes", are bent and curved into these enormous structures that seem to spill off the gallery walls. 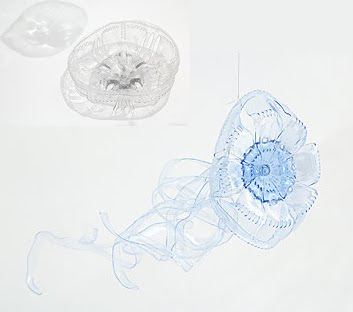 Miwa Koizumi turns PET bottles into underwater creatures using a combination of heat guns, soldering irons and different cutting utensils to make these PETs. She says: "I wanted to work with glass but this is more fun. I have as much material as I want just by fishing in the garbage." 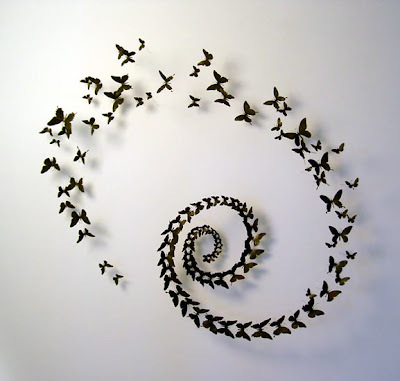 Paul Villinski creates flocks of swirling butterflies from old beercans from the streets of New York, which are pain-stakingly cut into these fluttery configurations. The artists says the pieces explore themes of transformation and recovery through metamorphosis. Kudos to all! Seeing 'trash' metamorphose into art or functional pieces of everyday design-ware, is just fabulous, and I love that there's now a site indexing it all. Superuse let's you submit your own work or the work of others, so check it out! 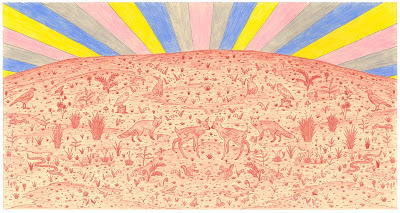 I found these interesting drawings recently by artist Michael Krueger. 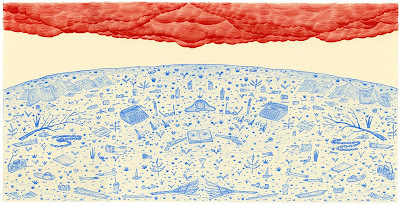 Though most of the artists repotoire is overtly concerned with the idea of Westward Expansion and the exploration by those of European descent of of the American West, there are definitive sub-notes of commentary on environmental issues here as well. Or at least it's impossible for me to think about Manifest Destiny without thinking about the conquering of the natural world in the New World --- leading to the eventual, shall we say, desecration of the American wilderness. I found this sentiment most notably in this pair of drawings. Go ahead and click to enlarge them to appreciate the details, and I think you'll see what I mean.